One of GB’s brightest marathon talents chats about her aims for the European Championships and provides an insight into her life as a full-time athlete. Affectionately known as the ‘pocket rocket’ since she first burst into the international public eye 11 years ago, Charlotte Purdue is set to fight for her first individual senior championships medal in Berlin next month. 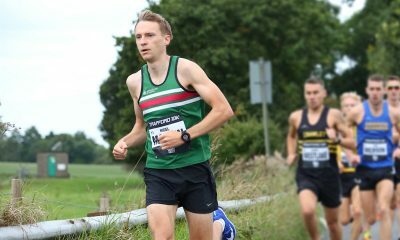 The 27 year-old Aldershot, Farnham & District athlete will contest the European Championship marathon in the German capital on August 12th along with an exciting crop of British female endurance talent, which includes Sonia Samuels, Caryl Jones, club mate Lily Partridge and Tracy Barlow. 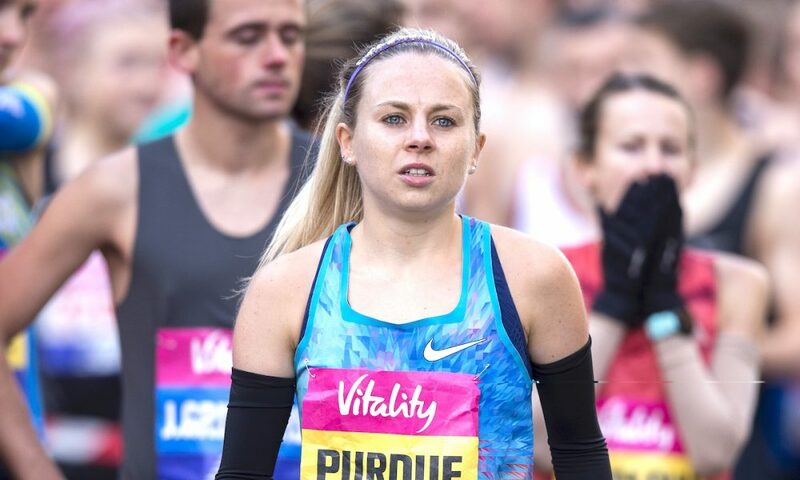 Purdue earned her selection for the championships when she was the first Briton home at last summer’s World Championships in London, running well inside the qualifying time there and then again at the Saitama marathon in Japan. 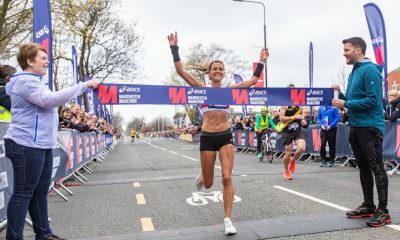 Berlin will represent her sixth marathon following an impressive 2:32:38 first outing over the distance at the Virgin London marathon in 2016, which still stands as the fastest ever debut for a British 24-year-old. The reigning U20 10,000m British record holder followed that performance up with an even quicker one in Frankfurt (2:30:04) later that year, and 2017 saw her compete in London again (2:29:23), the World Championships (2:29:48) and finally in Japan, where she ran 2:30:34 to finish fourth last November. 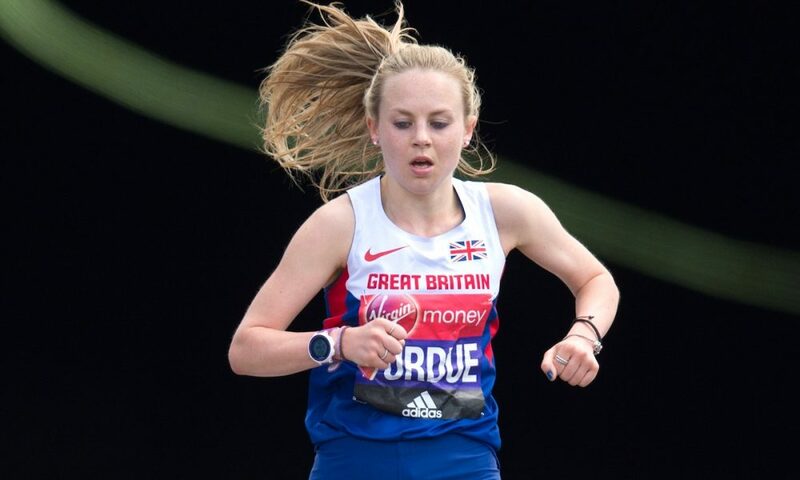 Purdue enjoyed multiple successes as a junior athlete – highlights of which include a European U20 cross country gold medal from 2010 – but it is her longevity since then, despite suffering serious injuries, that makes this particular pocket rocket tougher than most. Since that gold medal winning performance, she has pulled on the GB vest 17 times, with a silver medal from the European 5000m in 2010, a fourth place finish in the Commonwealth Games 10,000m in Delhi and an U23 European cross country championships bronze from 2013 the stand out results amongst many. The diminutive speedster also enjoyed a great year in 2011 when she followed up winning the English National with a 14th place in the World Cross Country Championships, just 65 seconds behind the winner, a certain Vivian Cheruiyot. Returning to the present day, and with the European Championships marathon on the horizon, Purdue hasn’t competed over 26.2 miles since Saitama nine months ago, so what kind of shape is she in? Has three classy half marathon performances, with none more so than her race winning time of 70:29 at this year’s inaugural Big Half, which was not only a PB and the 10th fastest ever for a British woman, but also the fastest time by a Brit in nearly four years, boosted her confidence in the interim period? We chatted to the London-based full-time athlete about her aims for the marathon in Berlin and beyond, what being a full-time athlete actually entails, and how she’s fought back from injury to become one of GB’s brightest young marathon talents. Fast Running: First up, well done on your Berlin selection! How has your training prepared you for one of the biggest races of your life, are you feeling confident? Charlotte Purdue: I’m really excited to run in Berlin at the Europeans! 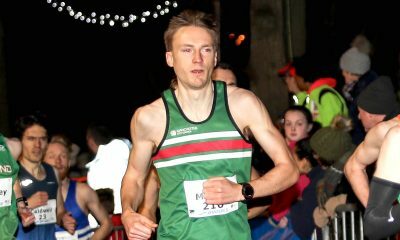 I had an injury in March which meant I had to miss the London marathon, which had been a big target for me, it was very disappointing. However, I think the time off did me good, and I feel stronger than ever now. FR: Your injury in March was a bone stress reaction in your thigh – how was your recovery and what role did cross training play in your rehab and comeback? CP: I found out about my bone stress in March just after the World Half. I’d actually had a pain in my quad since the previous November but I carried on running on it. I remember it was worse after hard sessions. I got an MRI scan in Font Romeu when I was there training for London. I decided to stay out there and cross train which was a good decision. My boyfriend Adam (Clarke, a 3:38.35 1500m athlete) and my training partner Steve (Connor, top cross country runner and sports podiatrist) were both there and helped me with cross training. Steve would come to the pool with me every day and I’d do 75-90 minutes in the pool. In the evening we would go to the gym and cycle. Having a structure to my cross training really helped me. FR: Your marathon PB is from last year’s London marathon (2:29:23) – do you feel like you are capable of revising it significantly, and if so, what do you think is a realistic target for Berlin? CP: I really wanted to run a faster marathon time in London this year, I think I can definitely run faster than 2:29. Berlin might be a slower tactical race so I’ll have to see, but I know that in the near future I can definitely revise that time! FR: What does a typical week’s marathon training entail for you, and do you have a particular marathon session you swear by? CP: My training is different every week, but I typically double run every day except Sunday. I do two sessions a week, one on Tuesday and one on Friday. I then do a long run on Sunday. My Tuesday session is usually intervals on the road, and then Friday is usually a long tempo session. I find the long runs key to showing how fit I am. If I can do a 2hr 30min long run at a quick pace and feel strong, I know I’m ready to race. FR: You’ve worked as a personal trainer in the past, but most of your career has been spent as a full-time athlete – what does a typical day look like for you? Breakfast, such as porridge and berries and peanut butter. Lunch, such as avocado on toast or a chicken salad. Emails/Coaching(Purdue Performance) / Netflix / read. Gym session / core session. More coffee (I don’t nap!). Dinner – whatever I feel like! Sometimes a sports massage. Adam is a sports massage therapist, so I usually get treatment when he finishes work! Chill out and go to sleep! FR: What are the best things about being a full-time athlete, and what are the worst? CP: The best and worst things about being a full-time athlete are travelling the world. It’s great to see different places and train all around the world, but it’s also the worse because I sometimes miss home (and my dog!). I do love Australia though, so any excuse to go there! Injuries are also the worse. PB’s are the best. FR: You’re not a funded athlete so how do you manage financially with full-time training and racing abroad? It’s interesting to note that not one single female endurance roadrunner is lottery funded! CP: I’m not funded but British Athletics do help me out. I’m currently in St Moritz in Switzerland on an altitude camp funded by them. I’m also sponsored by Nike and Revvies Energy Strips. I am able to fund my other training camps through my race earnings. Nic (Bideau, Charlotte’s coach since 2014) is great at finding me races which help me pay for training camps! FR: You mentioned your coaching company, Purdue Performance, what does that involve for you? CP: I set up Purdue Performance with Adam, it’s really exciting. I was doing a bit of personal training before, but with all my travelling it was hard to keep it up. Having Adam on board as well is great because he is also an elite runner and has a lot of knowledge. We offer online coaching to any level of runner looking for structure and to improve. Our website is www.purdueperformance.com – we are also on Instagram! FR: With all your years of running experience and now your coaching business you must be an expert at fuelling up properly for training! What supplements do you use, and are there any nutrition tips you can pass on? CP: Coffee is probably what I swear by to get me through my daily miles! I use Revvies caffeine Strips when I don’t want to drink coffee. I have a big sweet tooth as well! I don’t cut anything out of my diet and I believe that eating well 80% of the time is key. The other 20% is for treats! After sessions I’ll use Science In Sport (SIS) electrolyte tablets. 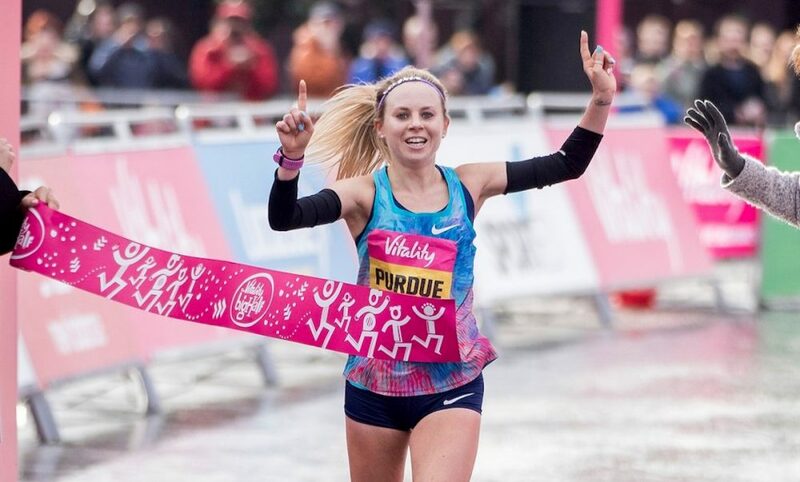 With the Tokyo Olympics only two years’ away, when Purdue will still only be 29, the future looks bright for the girl who holds PBs of 15:23.4 and 32:03.55 on the track for 5000m and 10,000m and 32:10 and 53:45 for 10k and 10M on the road. Before that comes the European Championships marathon, though, and a medal there could even set her up to challenge for a top ten position in Japan in 2020.